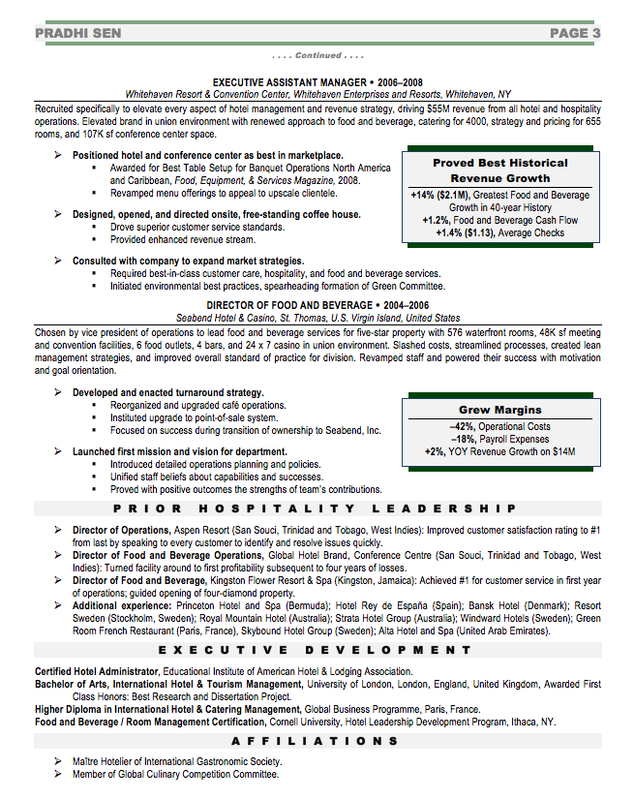 I had the privilege of creating a career portfolio for Pradhi Sen, an executive hotelier with global general management expertise spanning decades. Pradhi called me at the height of his frustration; despite the fact that he had submitted the multipage résumé he created for himself to dozens of positions over several months, he was getting absolutely no traction in the United States or abroad. In speaking to him initially, it was eminently clear that he had not conveyed his expertise succinctly or effectively. I promised him we would change his trajectory. Content focused on quantitative outcomes: As a hotel turnaround expert, he demonstrated the value of the changes he instituted with specific metrics. Branding of an expert: The reader can skim the main bullets and understand the value he delivered throughout his career. In fact, these main bullets became the foundation for a one-page networking resume. Color selection: Pradhi repeatedly commented that in many of his leadership roles, he instituted green strategies to maintain the resorts’ pristine and exotic locations; the color choice reflects that commitment in a crisp presentation. Simplicity of design: Calling out the metrics demonstrating Pradhi’s success generates a deeper read of the supporting bullets, the first levels of which satisfy a rough skim of the document, and the secondary levels of which validate his accomplishments with reports of specific strategies and tactics he implemented. Pradhi was nervous about the executive career portfolio development process, given his recent lack of success with the résumé he prepared on his own. He graciously requested that I put a rush on the project, so he could apply for a choice role immediately. I gladly did so, having learned of the level of his experience and the many stories he related about the tangible turnaround strategies he devised and implemented in major hotel brands across the globe. I delivered his portfolio to him on a Saturday in late May and didn’t expect to hear from him on his progress for a few weeks. Three days later, on Tuesday morning, he called to tell me that his resume generated a phone interview with a human resources director and the vice president sponsoring the position within 24 hours of his having submitted it to the organization. About two weeks later, he received a plane ticket to a major resort area in Southeast Asia with the expectation that he would travel in a few days to sign a contract, based on his reputation and his résumé alone, for the general manager position; he declined this compelling offer. Several days after that, he Skype interviewed with the CEO of a major international resort chain for a general manager role in Southeast Asia; additional interviews are currently scheduled. 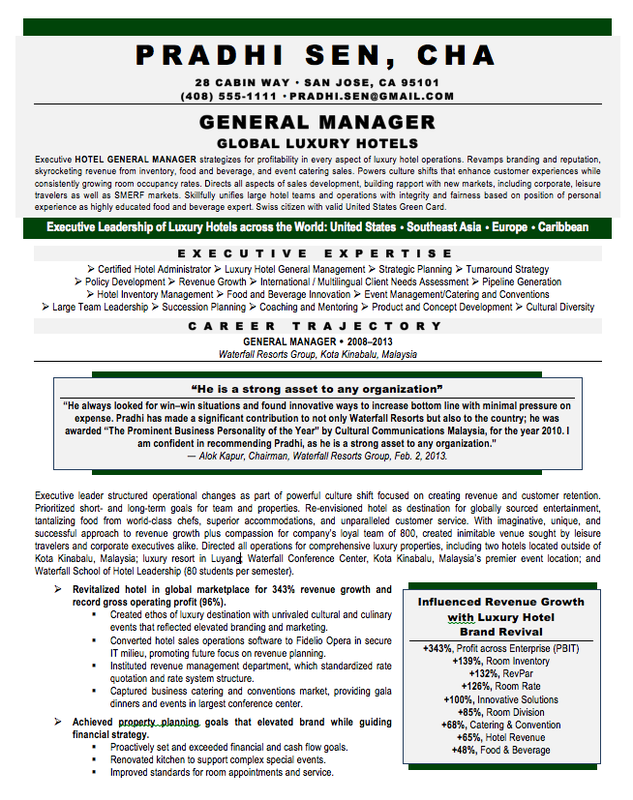 The client ultimately secured a general manager role for a luxury Caribbean resort. 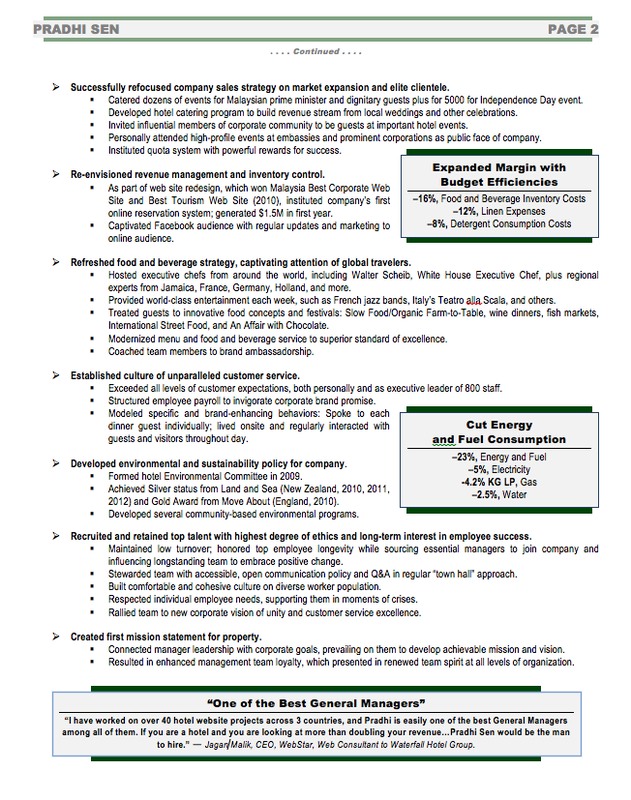 This resume earned third place for Best Executive Resume in the TORI competition of 2013.